Although native to Africa and Southern Europe as far east as central China this pest has been introduced to many countries and has established populations in Argentina, Brazil, Canada, Chile, Falkland Islands, Finland, Hawaii, Ireland, New Zealand, Siberia, Sweden, Uruguay, USA, West Indies and Australia. 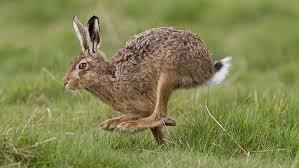 In Australia, hares were introduced for sport. Coursing (which involves using hunting dogs to chase a hare) was a popular sport in Britain and Ireland and early Australian settlers were keen to establish a population of wild hares for this purpose. Tasmania was the first to attempt a colony of European hares in the 1830s however this initial endeavour to establish wild populations failed. It was on Phillip Island in 1863 that a breeding colony of hares was set up by the Acclimatisation Society of Victoria to supply hares for further introductions to mainland Australia, Tasmania and New Zealand. Unfortunately (in my view) these new introductions were successful and by 1870 hares had been distributed throughout south-eastern Australia, South Australia, Tasmania and Queensland. Hares were introduced to Western Australia in 1874 and 1902 but did not establish persistent populations. 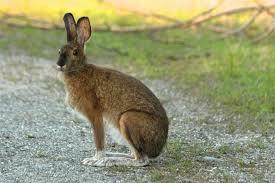 Unlike rabbits, hares do not burrow and are generally solitary, except during late winter breeding. The female is the larger of the two. They prefer grassland and open woodland habitats. It is likely that agricultural practices, such as clearing of forests, helped in expanding the distribution of hares by increasing the amount of suitable habitat for them (as experienced when virgin mallee country in Victoria was cleared for farming in the 1930s and 1940s). In the latter part of the first decade in the 1900s, hare populations naturally declined (not only due to the persistence of humans). 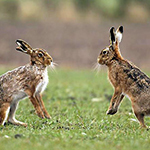 There is some evidence to suggest that it was not only eagles who prey on the hare young (leverets) but the increase in fox and rabbit numbers that curbed the population explosion of hares. They are prone to several different types of parasites and disease which cause a higher proportion of deaths than predators. Today, hares are NOT protected and are hunted throughout the year. They are regarded as minor agricultural pests, but are also considered a resource by recreational and commercial hunters. The total wholesale value of hare meat and skin industry in Australia is worth $200,000 at most (based on production of 20,000 animals with a value of $10 each). My interest in hares? They may be predominantly solitary however they can pack a punch as hares can cause significant damage when gnawing bark off young trees and shrubs. They also chew off the stems of young trees, damaging or killing the plant. In our case they took a liking to roses during the dry of this last winter doing considerable damage to the bushes. Their shear size standing on their hind legs to sup on the roses was incredible so taller roses also received the attention of the hares. Their range is huge (up to four kilometres) as they don't depend on burrow lodgings like rabbits so can roam freely looking for succulent green growth. Even when they breed the young are not demanding as they are only suckled once every 24 hours, allowing mum (Jill and males are known as Jack and offspring less than a year leverets) plenty of opportunity to roam for her food. What can we do about hares? Nothing much, just hope they don't ringbark too many trees/shrubs and trust they don't breed up too much! Further reading can be seen ABC's Rural News and wikipedia. OMG they are so cute, I would like to see one in real life but for that i have to travel internationally, which my budget doesn't allow,sooo i guess i just have to see them in pictures for now. Anyway amazing blog, well researched. keep it up :).